From Rev. 12.859+ is the "autogen-"-prefix (see below) by the option Automatically generated replaced. For routes, which still contain the leading "autogen", this will be removed during the next analyzer run and replaced by the new option. In the examples down on this page the changes did executed. Analyse the track plan and create all possible routes automatically. Sets the routes field in all track, signal and sensor objects → route representation (optional). Sets the block field in all track, signal and feedback objects for block occupancy display → block representation (optional). The direction track can be used to restrict a route generation only in that direction. 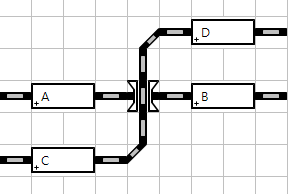 With connectors routes across other objects, empty fields and track plan levels can be created. Turnout commands are added to the route. Signal pair assignment to block (signals) as plus(+)- and minus(-)-side signals (optional). Enter- and In- sensor assignment to block (routes) (optional). The Analyser was introduced as a tool especially for the new and inexperienced user allowing for quick access to fully automated model railroading. However, with complex or unusual layouts the Analyser may fail to generate all routes possible or it may generate unexpected routes or in worst case it may even hang. In all these cases settings have to be adjusted or completed by hand while those routes generated correctly by the Analyser can serve as a blueprint. Track plan must be healthy before analysing! The Analyser can be activated manually. or by selecting Analyse from the File menu of Rocview. If the analyzer is re-started after changes to the track plan, all routes with the option "automatically generated" are deleted. This ensures that no invalidated routes are included in the plan before routes are created or recreated. The option "automatically generated" must be activated for all routes so the changes can be implemented. Manually-added routes with no auto-created option remain unchanged in the list. The graphic shows the positioning of feedback sensors ( fb ) and Distant- ( sgv ) and Main ( sgh ) signals for a block ( bk ). The sensors and signals are thus correctly assigned to the block and the routes of both sides of the block. On both sides of the block, the sensors and signals must be positioned between the block and the next turnout ( sw ). The order of objects between block and turnout is arbitrary. If the route between two blocks does not contain a turnout, then signals could be assigned to the wrong block. The sensors are assigned to the routes all enter + and all enter -, respectively. The all enter + route is for all routes entering the + side of the block (marked with the little + in the block). The all enter - route accordingly is used for all routes entering the - side of the block. Sensors have to be assigned to the routes on the routes tab of Block: Routes in the block properties. The assignment by the analyzer works only when using "enter" and "in" sensors. In addition, place only one sensor on each side between the block and the next switch. For blocks with one, three or four sensors there are no usable items. With more than one sensor on a block side, only the sensor nearest the block will be considered. The distant signal associated with a main signal of a block must be positioned on the opposite side of the block. The assignment is visible on the tab Block: Signal and can be changed manually, if necessary. Tip: If there is no route to be created in a track section in both directions, this can be achieved by two opposite direction track symbols, or for the time of analyzer activity, a track symbol is removed from the section. It must always be clearly formed with 0…655351) numbered connector pairs. The previously possible use of the numbers 0…9 for multiple connector pairs leads to the termination of the Analyzer run. The orthogonal positioning and mutually facing cut surfaces of both symbols are no longer considered. This includes divided bridge element (tracknr 2). So that the track plan for the analyzer is "healthy"
must be changed into a unique numbering for all levels in the entire track plan. Connectors can be used to connect distant elements: The analyser is seeking for a counterpart (second connector) in the same direction and ignores gaps and elements between these two. With connectors it's easy to connect different levels on the layout. Connectors configured with a track number between 0 and 65535 must have one corresponding connector with the same number anywhere in the plan. The direction of the counterpart doesn't matter. The counterpart may be on a different track plan level. With module plans, connectors can be used at the module transitions when paired are defined with the same number in the range 0…65535. Connectors at the module transition without a partner with the same number the analyzer reports as error. If the module layout is set up in a different compilation, the numbering of affected connector pairs must be adapted. If in the compilation two connectors with the same number are forgotten somewhere, "strange" routes can arise. To the mentioned disadvantages - among others: Errors, high effort for changes, etc. - it is recommended to avoid connectors at the module transitions. Instead of the connectors, "straight track elements" should be positioned so that they match each other without interruption when arrange the modules. This results in the perspective of the analyzer continuous track connections from which routes can be easily generated. With this method, all the disadvantages with connectors at module transitions are eliminated in a very simple way. The analyser ist not perfect, errors can occur. Not all 'weird' situations are recognized. The analyser configures sensors (feedbacks) only after the option "Assign sensors to blocks" in Sensors in blocks has been enabled (by default this option is off). If "Assign feedbacks to blocks" is activated, the analyser tries only to allocate the sensors enter and / or in in generic routes that are not yet fully generated (whether manually configured by the user or already existed from previous analyzes). Note: Previously configured enter and / or in sensors are maintained and the analyser does not change them (even if they were completely wrong). The above applies only to the closest (there are exceptions in special situations) sensors near a block that are unique to this block. If a configured enter2in is found in a block, then no change is made to this block. An enter2in sensor is never assigned (or deleted) by the analyser. Other accessory or track numbers are not supported . It doesn't know the various grid sizes and orientations of these symbols. Therefore, before starting the analyser these objects should be replaced temporarily (and possibly later again) with normal track objects. Q: Why is analyser always overwriting or removing my changes? A: At first the analyser deletes all routes with the activated option 'Automatically generated'. Q: How can I prevent analyser to recreate a route? deactivating the option 'Automatically generated' of "[A-]-[B+]"
calling analyser will leave "[A-]-[B+]" untouched (the option 'Automatically generated' is deactivated) and will not create any alternative route from [A-] to [B+], because there is already a "manually configured" route for this relation. To display the analyzer results, Trace: calculation must be activated. Activation of Trace level "Analyze" is not recommended. This option should be reserved for troubleshooting analyzer functions. Note: The message to the last action is at the top of the log. The connector with number 2 is missing the partner. The Analyser run was aborted because of the listed errors in the track plan. See Important change at the top of this page.